The English Princess Margaret Plantagenet married King Alexander III of Scotland in December of 1251. This was to be the third youngest marriage of monarchs in British history. Alexander was aged 10 years, 3 months and 22 days and Margaret was 11 years, 2 months and 28 days. 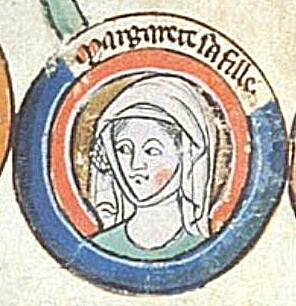 Margaret was born on September 29, 1240. She was the daughter of King Henry III of England and her mother was Eleanor of Provence. The entire family was affectionate and close. Margaret’s mother was especially protective and devoted. Eleanor spent most of her time with her four children at Windsor Castle supervising their care. They probably all received an education worthy of royal offspring. Margaret’s first appearance in historical record comes when she is three years old. She and her brother, the future Edward I, took part in an event in London. King Henry III’s sister Joan had been married to King Alexander II of Scotland until Joan died in 1238. Henry was very paternalistic towards his brother-in-law and they had many dealings through the years over government matters and territories. Alexander II had a son Alexander by his second wife, Marie of Coucy in September of 1241. Henry and Alexander II met in Newcastle in 1244 to renew peaceful relations between Scotland and England and the discussion of a marriage between Henry’s daughter Margaret and the little Alexander probably began at this time. About a year after Margaret’s appearance in London, she was betrothed. Because of her tender age, she remained with her parents until the wedding took place in 1251. King Henry himself made detailed and lavish arrangements for the wedding which took place at York Minster on December 26. The young couple remained in York until the end of January when they began their journey north to Scotland. In April 1252, they were in Linlithgow and from there made their way to Edinburgh which was to be their permanent residence. At the time of the marriage, it was believed young people should not have sexual relations until they were mature enough in age or their health would suffer. Alexander and Margaret were living together basically as brother and sister and this made Margaret very upset. She was fond of her husband and saw little of him. She also hated Edinburgh, the huge castle on the volcanic rock and the weather. Most of all she missed her family. She basically suffered from homesickness. Margaret poured her heart out in pitiful letters which greatly upset her parents. They asked if she could visit her mother in England but the Scots refused as they believed they would never see her again. In 1255, Eleanor sent her physician to Edinburgh to check on Margaret’s condition. He found Margaret pale and depressed, bitterly complaining of loneliness and neglect. The physician himself became very ill in the cold climate and died trying to make his way back to England. Before he died he wrote to Henry and Eleanor that Margaret was being treated inhumanely by the Scots. Henry was furious and sent a new delegation to find out the truth of the matter. He wrote to some of the Scottish earls demanding the situation be remedied and he promptly raised an army and travelled to Newcastle. From there he sent envoys to Edinburgh. Margaret complained she was a virtual prisoner, unable to travel in Scotland and not allowed to enjoy the embraces of her husband. The envoys agreed that because Margaret and Alexander were fourteen now they should be able to have marital relations. The couple visited with Henry, Eleanor and Margaret’s sister Beatrix at Wark on September 7, 1255. Alexander returned to Scotland but Margaret was allowed to stay with her family for a short time. It was agreed that a council of fifteen would govern Scotland for seven more years and then Alexander would rule on his own. It was declared on Alexander’s behalf that he would treat Margaret with all affection and she was to be allowed to travel south to visit her family. Margaret was satisfied and returned to Scotland and her husband. In the summer of 1257, Margaret received a visit from her brother Edward and he gave her an esquire as a gift in remembrance of him. This esquire claimed to have killed Margaret and Edward’s uncle, Simon de Montfort with his own sword. That same year, Alexander and Margaret were seized by the powerful Comyn family and held captive. The Comyn’s were insisting all foreigners be expelled from Scotland. Henry III and the regency council intervened and the power of the Comyn’s declined allowing Margaret and Alexander their freedom. In November of 1260, Alexander and Margaret visited her parents in England. Margaret was five months pregnant. Alexander returned to Scotland leaving Margaret to deliver her baby daughter, named Margaret, at Windsor Castle on February 28, 1261. Margaret returned to Scotland in May. 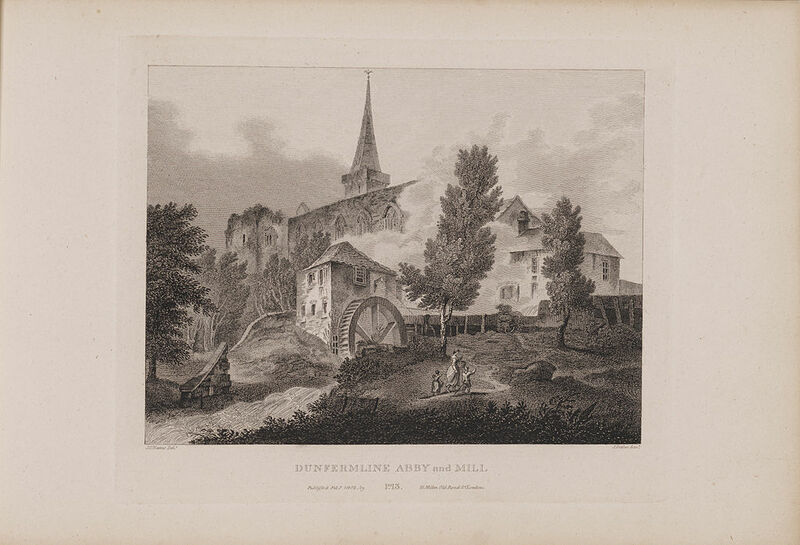 Three years later, her son Alexander was born at Jedburgh. In October of 1269, Margaret and Alexander travelled to visit her parents and attended the translation of Edward the Confessor’s relics to the newly renovated Westminster Abbey. Henry III was to die in 1272 but Margaret was unable to attend the funeral because she was pregnant again. Her second son, David, was born in March of 1273. Prince David was not in the best of health and Margaret was slow to recover from the birth. She went to Kinclaven Castle near Perth for the summer to recover and a curious incident occurred there. One evening after supper, the Queen, accompanied by her confessor, some maidens and several esquires, including the one given to her by her brother, were all taking the air by the River Tay. The English esquire had dirtied his hands in some clay and went to the river to wash. According to the confessor, Margaret urged one of her maidens to push the esquire into the river. Everyone had a good laugh when he tumbled in. He began to shout and all thought he was joining in the fun. But the heavy current of the river dragged him under. The esquire’s little servant boy recognized his master was in trouble and jumped in to save him. They both drowned. It was recorded that Margaret was very upset by what happened. In August of 1274, Margaret and Alexander travelled to England for the coronation of Margaret’s brother, Edward I in Westminster. Margaret had always been close to her brother so it was a happy celebration. In February of 1275, Margaret fell ill while visiting Fife. She would only see her husband and her confessor. She died on February 26 in Cupar Castle. Alexander had her buried in the Abbey of Dunfermline. She was thirty four years old and had been Queen of Scotland for twenty-three years. Fascinating, revealing and well-written, as usual. Thanks, Susan! How do we know she sent sad letters home? No letters are extant, are they? It would be so wonderful to see some personal letters from medieval times. Hi Susan! So glad you enjoyed reading about your ancestor. You might enjoy “The Royal Stuarts” by Alan Massie. He gives short histories of all the Scottish kings including the myths too. Thanks for reading! An excellent summation of a not very happy life for Margaret. Makes one wonder where the “women’s libbers” were those 800 years ago. Why did no one protest the young age of the two “teenagers” to be married; why did no one protest the “slave like” conditions in which Margaret was held; why did she have to die at such an early age (no doctors for women? )?